We define the mathematical symbolic register as a situationally defined collection of individual symbols in the mathematics context. We subdivide this register into three sub-registers: the English letters sub-symbolic register, the commonly used mathematical symbols sub-symbolic register, and the abstract symbols sub-symbolic register. In order to test students' ability to work with each sub-register, cryptograms were created using the three sub-symbolic registers and college students were asked to complete these. A small but significant difference was found in student performance across the three registers, with the best performance occurring in the letters sub-symbolic register. We conclude that the choice of sub-register used to pose mathematical problems accounts for only a small part of the difficulty students have in performing mathematical tasks. Research in cognitive psychology has shown that the mind processes letters and symbols differently. Tydgat and Grainger (2009) demonstrate that reaction times vary when subjects attempt to recognise various images in an array of letters, symbols or digits. They showed that people process symbols differently from letters and digits, and the processing of symbols take longer than that of letters and digits. Understanding these differences may help explain why students find symbols intimidating in mathematics classrooms (Cobb et al.,2000). An increased cognitive load caused by processing the symbols could contribute to the challenges students face working with mathematical symbols. Berends and van Lieshout (2009) showed that the additional cognitive load caused by accompanying illustrations had a detrimental effect on both the speed and accuracy of students' performance in solving arithmetic word problems. It is possible that the additional load required to process mathematical symbols, could also distract students from focusing on the underlying mathematical concepts. However, many mathematics teachers believe it is advantageous for students to use symbols if they understand the meaning and processes associated with them. DeLoache (2005) studied how and when children acquire the capability to understand symbols. It is complicated for children to understand that one object can stand for another, but it is vital for them to develop the ability to work with symbols to succeed in our world today. He tested 2½- and 3-year-old children by showing them where a toy was hidden in a small model room and having them try to find that toy in the same place in a real room. It was found that 2½-year-old children were too young to find the toy, but 3-year-old children mostly succeeded in finding the toy. This ability to recognise and process symbols develops over time, and becomes a fundamental tool in mathematics education where symbols are used to represent abstract concepts, which, in turn, makes advanced computations simpler. Students, especially those on algebra courses, struggle to make sense of the letters and symbols used in the classroom (Samo, 2009). To address this issue, the work of Gagatsis and Elia (2004) has focused on understanding how the choice of symbolic representation of a concept affects student learning. Other studies have also proven that symbols are effective when students understand the connection between the symbol and the mathematical concept. Heath (2010) defines symbols as a mathematical tool, not a set of instructions. He wrote about his experience teaching elementary students how to use the 'greater than' symbol. Students need to first visualise and represent concepts in a meaningful way. Then they learn the shorthand symbol for representing those ideas. In order to teach the 'greater than' symbol, Heath showed his students three pictures of trees decreasing in height. When the students recognised that the tree to the left was larger than the tree to the right he let his students discover that the symbol '>' meant the object on the left was greater than the object on the right. Slowly the pictures of the trees were replaced with numbers and values. Heath's study showed us that it is more important for students to understand what the symbol means than the name of it. Using symbols in mathematics allows students to share mathematical thinking efficiently. Marshall (2006) believes that mathematics teachers need to help students understand symbols and avoid rote instruction. After studying how students learn how to count, Marshall recognised that when students work with symbols they must know what they mean and where they are from. Students need to have the ability to make use of mathematical concepts using symbols in many settings. As symbols play an important and complicated role in mathematics education, we seek to recognise the effect of the type of symbol used on problem solving. To do this we borrow the terminology of linguistics. In the field of linguistics, a register is a situationally defined variety of language (Herbel-Eisenmann et al.,2010: 24). Herbel-Eisenmann looked at how groups of words mean different things and have different connotations in different settings. For example, the word ear means something different in different settings. An ear can mean the body part of a person or a piece of corn. Registers exist in all areas of study. Mathematics registers refer to words in a mathematical context only. For example, when students see the symbol U, they might think it is referring to the word 'you.' This is a common shorthand symbol people use when texting each other. However, when this symbol is used in a mathematics register, it refers to the union of two sets. Students must be able to differentiate between these registers in order to correctly complete a mathematics problem. Mathematical registers are used in the study of common groupings of words in a specific mathematics discourse. Mathematical registers are also used in studies stressing the importance of using mathematics language every day, even in solving linear differential equations (Herbel-Eisenmann et al.,2010; Shield, 2004; Dana-Picard and Kidron, 2008). The work of Cobb et al. (2000) was initiated during a 1995 forum of mathematics educators. At this forum the educators discussed the topic of symbols and their meanings. The questions brought forth were those such as: How do symbols acquire meaning? How is meaning achieved? What role do symbols play in students' mathematical learning? The discussion of these questions prompted the book Symbolizing and Communicating in Mathematics Classrooms: Perspectives on discourse, tools, and instructional design. During this investigation of symbols the authors found that it was vital in answering the questions brought up in discussion to understand that some of the same concrete symbols serve different symbolic functions in different registers. It is important to note that a register may also be used on certain occasions and not on others (Primm, 1987). In our study we seek to understand whether or not using a specific sub-symbolic register to pose the problem has a direct effect on the students' ability to comprehend and solve a mathematical problem. A significant difference in accuracy would suggest that the choice of visual representation of the concept may be introducing an additional and unnecessary cognitive load. The abstraction that symbolic representation provides is a fundamental tenet of mathematics. However, from a mathematical prospective the visual representation of that symbol has no meaning. If no significant difference in accuracy is observed, this would indicate that the specific visual nature of the symbol does not affect the cognitive load. This study is motivated by recent literature suggesting that cognitive load is affected by the choice of visual or audio representation of a mathematics word problem (Klingner et al., 2011). To measure the effect of the choice of sub-symbolic register, we created a mathematical problem, a simple substitution cipher, where the solution process is independent of the choice of sub-symbolic register used to pose the problem. Figure 2 explains the layout of our experiment. In order to make the choice of symbol the only independent variable the word order and word choice were fixed. Before completing the cryptogram each participant or learner was read the same directions. The messages on the cryptograms were given to the learners in the same order. Therefore the word order and word choice were the same for each learner while they were completing the task of finishing the three cryptograms. The symbols used for each cryptogram varied between the letters sub-register, mathematics symbols sub-register, and the abstract symbols sub-register. Therefore during this experiment we were testing whether the choice of symbols affected the learner's ability to solve a cryptogram. In a simple substitution cipher, a message in plain text is encrypted in order to hide the original message; one encrypted character represents one letter in the message. The goal is to decrypt the cipher by figuring out the original message. 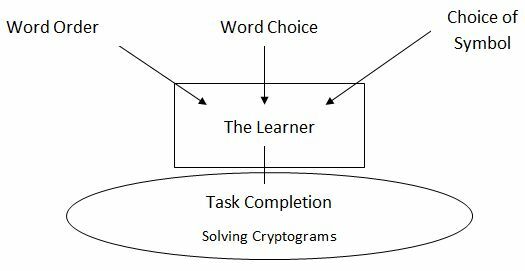 Cryptology is a mathematical concept that can help students with their mathematics problem-solving skills (White, 2009; Kaur, 2008). Therefore, using different sub-symbolic registers to encrypt each message would help us see the difference between students' ability to work with each sub-register. A school message, a sports message, and a summer message were all selected for encryption. Each of the three messages was encrypted with the three sub-symbolic registers: letters, mathematics symbols, and abstract symbols. Every person received the school message first, the sports message second, and the summer message last, each with a different type of encryption. The type of encryption used for each message was varied within subjects. This fixed the word order and word choice, isolating the choice of sub-symbolic register as the independent variable. There were 180 participants in total, with 30 attempting each arrangement. The participants were students over the age of 18 from a public, liberal arts university in the southeast of the USA. Each student completed a survey consisting of three cryptograms. The participants were allotted four minutes to attempt to complete each cryptogram: this did not give all the participants enough time to finish each cryptogram completely, but it did give them enough time to think through the process and at least partially answer. This was necessary in order to have variation in the percent correct. Students used the same process when solving each cryptogram. The process of a simple substitution cipher would be to identify key phrases, substitute the letters, check to see if phrases are correct, and use context clues to complete the puzzle. However, even though the same process was used, they saw different characters in each cryptogram. The students were forced to use different sub-registers in each cryptogram. Therefore, the particular sub-symbolic register was isolated in each cryptogram. Students' abilities to work with different sub-symbolic registers were shown through the number of characters correctly identified out of the total number of characters in the cryptogram. 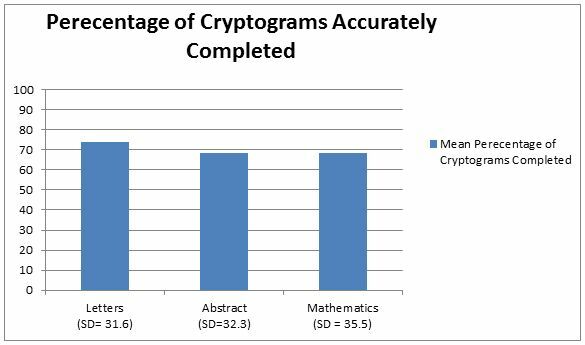 A repeated-measures analysis of variance (ANOVA) was used to test whether the sub-symbolic register used to encrypt the cryptograms affected the decryption accuracy. The ANOVA showed that there was a significant difference between the use of the letters sub-register, mathematics symbols sub-register, and abstract symbols sub-register when solving the cryptograms, F (2, 358) = 3.49, p = .032. This is a small effect, accounting for only 1.9% of the variance in decryption accuracy, 2= .019. Fisher's Least Significant Difference (LSD) tests were performed to determine which of the three sub-registers differed from each other. The LSD revealed that decryption accuracy was significantly higher in the letters sub-register (M= 73.70) than in both the mathematics symbols (M= 68.30) and abstract symbols sub-register (M= 68.22), which did not differ from each other. In his book Speaking Mathematically, Primm explains that 'many errors that occur in algebra do so precisely because algebra is frequently approached in such an abstract symbol-manipulating manner, without any regard for possible meaning' (1987: 20). In a similar fashion many people have difficulty solving cryptograms because they view the process as simply an arbitrary symbol change, as opposed to using context clues to help decode the message. This connection between cryptograms and algebra was explored by Evered and Gningue who used simple substitution cryptograms to help students develop algebraic problem solving skills (2001). Our experiment showed that the choice of sub-symbolic register used to pose a cryptogram has a small but significant effect on the difficulty of completing the cryptogram. While the visual form of the symbol did affect problem-solving accuracy, this only accounted for a very small percentage of the variance in decryption accuracy. This suggests that the choice of visual representation may have affected the cognitive load required to process the symbol, slightly reducing the participants' ability to solve the cryptogram within the four-minute time constraint. Regardless of the sub-symbolic register used in posing the cryptogram, many of the subjects still had difficulty solving the puzzle through symbolic manipulation. This suggests that once participants recognised the symbols and understood the process there was little difference in their ability to solve the cryptograms containing the three sub registers. The very small difference in problem-solving accuracy provides quantitative data to support the claim that more time should be spent on the meaning of a symbol as opposed to developing procedural familiarity with the symbol itself (Capraro and Joffrion, 2006; Heath, 2010; Lannin et al., 2008; Marshall, 2006; Sajka, 2003). If the individual symbols have meaning, then the students will better understand how to perform the process for which the symbol represents. Symbols are designed to make mathematics easier as long as the meaning of the symbol is established prior to using it (Heath, 2010: 30). Rachel Webster is a first year mathematics and social studies teacher at Banks Trail Middle School . Dr. Rusinko is an Assistant Professor in the Department of Mathematics at Winthrop University. Dr. Hayes is an Assistant Professor in the Department of Psychology at Winthrop University. Heather Martin is a first year mathematics teacher at Clover High School. Gagatsis, A. and I. Elia (2004), 'The Effects of Different Modes of Representation on Mathematical Problem Solving', International Group For The Psychology Of Mathematics Education, 17 (6), 658-672 Retrieved from ERIC database. To cite this paper please use the following details: Webster, R., Rusinko, J., Hayes, M. and Martin, H. (2012), 'Examining the Mathematical Sub-symbolic Registers Using Cryptology', Reinvention: an International Journal of Undergraduate Research, Volume 5, Issue 2, www.warwick.ac.uk/reinventionjournal/issues/volume5issue2/webster Date accessed [insert date]. If you cite this article or use it in any teaching or other related activities please let us know by e-mailing us at Reinventionjournal at warwick dot ac dot uk.